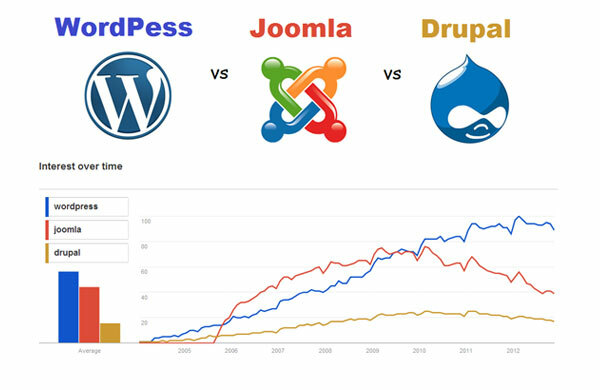 WordPress, Joomla and Drupal are the leading free content management systems (CMS) used today. If you are planning to set up your own website for free, you need to choose from these three. Your decision to choose any one of the three depends on the nature of your website and the technical skills you possess. WordPress is more suitable for blogging sites but also offers plugins and widgets that make it suitable for conventional websites as well. Website owners do not need to have a lot of coding skills to manage a website on WordPress effectively. On the other hand, Drupal is entirely based on open coding and can only be used if you are a good coder. Joomla lies somewhere in between the two and even someone with rudimentary coding skills can use it. Uploading content on WordPress is also much easier compared to Joomla or Drupal. If you have content in a Microsoft Word file, you can simply copy it and paste it into WordPress. With Joomla, things get a bit more complicated and you need to spend some time becoming familiar with the Joomla terminology. Drupal is only recommended if you have a firm grasp on software technicalities and can devote yourself to learning how the software works. For beginners, WordPress is definitely the best option because it is highly user-friendly and even non-technical users can learn to use the WordPress system and update content on the website in very little time. There is a rich collection of themes and other features that are simple to use by ordinary users. Joomla is especially popular among social networking users since it comes with a platform and features that can be used effectively to create an online community and facilitate interaction. Drupal is clearly meant for those whose interest lies in the back office tasks. Tagging is extremely easy with Drupal and you can also organize content more efficiently and accurately with Drupal features. The primary type of plugin used by WordPress is the WP-SuperCache which offers high speed loading of content and converts database content into HTML files in very little time. Joomla is preferable due to its high speed downloading and discretion over what pages are cached. Drupal is highly scalable which makes it convenient for small as well as large businesses provided they have the technical skills required to use the Drupal CMS. Naturally, WordPress is the most popular of the three CMS mainly due to its ease of use. WordPress has been downloaded approximately 140 million times compared to Joomla (30 million times) and Drupal (15 million times). WordPress and Drupal offer a large number of themes (more than 2000 and 1800 respectively) while Joomla offers only 900. 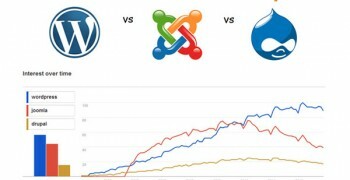 WordPress and Drupal also beat Joomla in terms of free plugins (27000 and 24000 for WordPress and Drupal; 7000 for Joomla). While WordPress requires the least amount of time to install on the system (5 minutes), there is negligible difference between the time it takes to install Joomla or Drupal (approximately 10 minutes for both).